BELMOPAN, Cayo District, Wed. Nov. 22, 2017–Today, the Senate Special Select Committee held its fortieth sitting to investigate the findings of the special audit which documented some of the darkest days at the Immigration Department, between the years of 2011 and 2013. Today’s session, however, was off to an unusual start, because this morning the committee met privately with the head of the Financial Intelligence Unit (FIU), Kent Clare. We say unusual because the committee’s Terms of Reference call for the hearings to be held publicly. It has not held a private sitting previously. Reliable information to Amandala is that Clare was asked point-blank by the committee if the FIU was interested in investigating any of the witnesses who have since appeared before the committee. We understand that the FIU is indeed interested in investigating some previous witnesses. However, neither the committee nor the FIU has issued an official comment on the matter. The second witness, Nigel Hawke, the Solicitor General of Belize was called before the committee for the afternoon session. Referencing the fact that nationality is granted by the Minister with responsibility for the Ministry of Immigration on the advice of the Director of the Department of Immigration, Opposition Senator Eamon Courtenay wanted Hawke to explain who should ultimately be held responsible for the granting of nationality in cases where it was issued to persons who did not qualify. According to Hawke, it would be the Director of the Department of Immigration. Hawke explained that if at any time the Director of Immigration had suspicion about any of the applications, the Office of the Solicitor General could have been contacted for advice. Senator Courtenay then quizzed Hawke about Ministerial interference in the work of the Immigration Department — cases which were documented by the Auditor General. Amandala has reported several instances where current and past UDP Cabinet ministers, UDP mayors, and UDP affiliates have intervened in the process without having any legal authority to do so. Senator Courtenay asked Hawke what should be done by the director in cases where the letters and instructions from Ministers become a regular occurrence. Hawke explained that the Minister with responsibility should take the matter up with his colleagues who are engaged in such activity. According to Hawke, who has been in the Office of the Attorney General for the last 7 years, his office has not been asked for any advice on the ministerial recommendations and interference in the work of the Immigration Department. He revealed that his office has only been sought for advice regarding some questionable documents. Senator Courtenay then turned to the matter of the 2,000 or so persons who were fraudulently granted nationality on the heels of the 2012 election. In 2016, the Opposition People’s United Party (PUP) went on record to say that those persons voted in an election which the PUP lost by a total of only 800 votes. Courtenay asked Hawke what was the process for revoking a nationality. According to Hawke, the Director of Immigration would contact the Office of the Solicitor General for advice, but ultimately, the Nationality Act gives the Minister of Immigration the power to revoke nationalities. When Courtenay asked who should be leading the task of revocation, Hawke explained that it would have to be the Chief Executive Officer in the Ministry of Immigration, in collaboration with the Director of the Immigration Department. Hawke explained that he was not aware of any legal obstacle that could be a reason why the process has not commenced. He suggested that perhaps the department was waiting on the completion of the sittings and the outcome of the committee’s report. 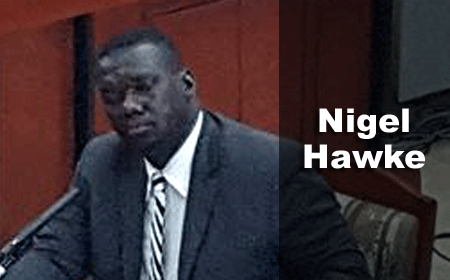 Hawke was also asked to comment on the case involving Swedish national Peter Dahlstrom, who married the sister of Kim Simplis Barrow in 1994 but never lived in Belize for an entire year and thus, according to the Auditor General, did not qualify for nationality. This case has caused much debate before the committee. Instead of taking a position, however, Hawke explained that he needed time to properly review the act. “I would think that is a section we would need to look at very closely, have the legislative drafters look at it also, and certainly, we can undertake to provide a comprehensive opinion as to our interpretation of that section,” he explained. Another matter that has caused much concern for the committee is the renunciation process for Guatemalan nationals seeking to acquire Belizean nationality. For now, the process has been put on pause because authorities are yet to determine if the renunciation must take place before the process for Belizean nationality begins, and if that would result in Guatemalan nationals becoming temporarily stateless. According to Hawke, Belize has developed a strategy to deal with the matter, a strategy which will be shared with the committee. After an hour in the “hot seat,” Hawke was free to leave the hearing. Amandala understands that former Director of Immigration, Maria Marin, and the Auditor General, Dorothy Bradley, will be the last two witnesses to reappear before the Senate Select Committee.